Sustainable materials may be de rigueur, but unlike some of the more high-tech substances out there, cork has an age-old appeal to match its eco credentials. The use of it helps the planet – a cork tree that has had its bark harvested absorbs up to five times more CO2 than one left idle – and it’s endlessly versatile: softer and more forgiving than wood, impermeable yet breathable, lightweight, buoyant and insulating. A series of cork architecture projects have put it in the spotlight. First there was Chinese artist Ai Weiwei’s cork Serpentine Pavilion in 2012. The following year, French designers Ronan & Erwan Bouroullec unveiled their ‘Quiet Motion’ cork seating installation at the Milan Furniture Fair, designed for BMW’s electric car division BMWi. 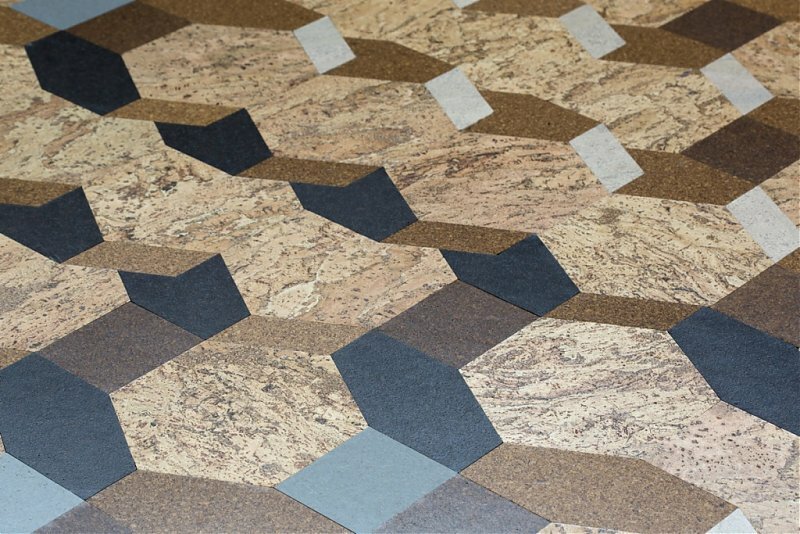 And at the London Design Festival last September, Amorim, the world’s largest producer of cork, reinvented the humble cork tile. Its flooring display at the Victoria and Albert Museum featured a trompe l’oeil geometric pattern. Product designers have contrasted cork’s utilitarian beauty with glossy finishes such as glass, metal and ceramic. Many have also used it to create barware inspired by the most common use of the material, as a sealant for wine bottles. Aurélien Barbry’s ‘Wine & Bar’ series for Normann Copenhagen consists of corkscrews and bottle stoppers; Carlo Trevisani’s ‘Appo’ design for Seletti is a cork stopper with a platter on top that transforms an empty wine bottle into a table centrepiece. The dense but light structure of cork means it can be cut in endless different ways, so you can use it to make anything from a lampshade to a chair. Why not try it out for yourself?